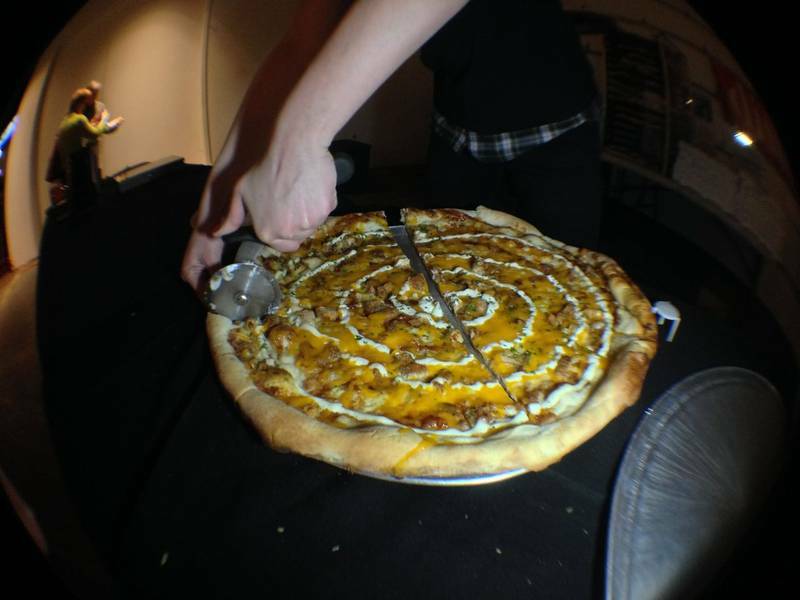 Revolution Brewery and Dimo’s Pizza team up for a very special, very offbeat Special Pizza. First there was gelato doughnut sandwiches from Glazed & Infused and Black Dog Gelato. Next came fried chicken pizza from Honey Butter Fried Chicken and Piece. Now it’s time for another zany collaboration, a special type of pizza-beer pairing conspired by Revolution Brewery and Dimo’s Pizza. Created for Chicago’s Comic Con, the beer and pizza duo make for a one-two punch of offbeat sensations, which is pretty much exactly what you’d expect from a Comic Con-inspired meal. It all starts with Revolution’s Galaxy Hero, an aptly named, comic-friendly beer described as “an IPA that shoots a raygun blast of Galaxy and Zythos hops into your mouth and leaves a crisp, dry finish.” OK! So basically if you’ve ever wanted to drink a beer that made you feel like you were hurling through outer space, evading intergalactic battle and getting shot in the mouth, this is the beer for you. It’s a tall order to contrive a dish to pair with such a mighty brew, but Dimo’s was up to the task…………..